2.30pm | In conversation with emerging curator Sophia Cai, academic Dr Kristen Sharp and curator/artist Pia Johnson about Chinese contemporary art and cross cultural artistic platforms within Australia today. Chinese Whispers and Other Stories is an exhibition that brings together four artists, all female, all with Chinese heritage living in Australia. 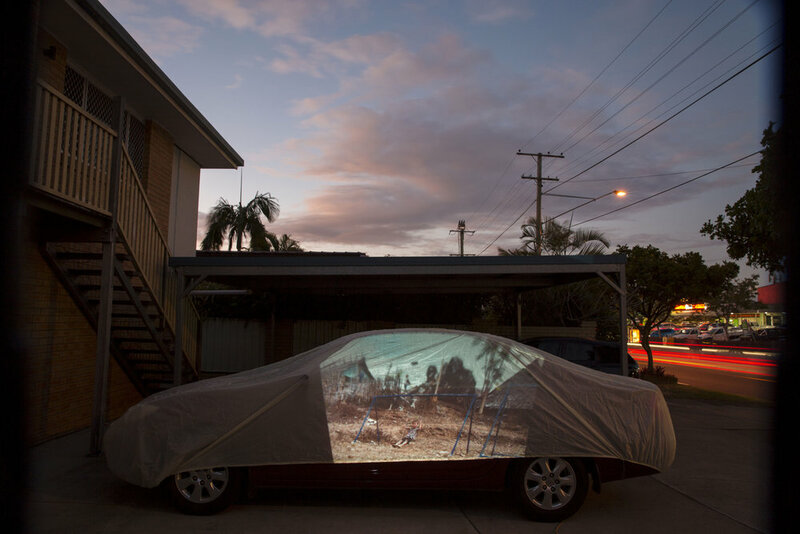 Through photography and video, the works of Tammy Law, Janelle Low and Siying Zhou alongside my own works explore different perspectives into contemporary issues of cultural identity, migration and belonging in Australia today. The impetus to curate this exhibition was to provide a space where these voices, stories and experiences could be shared. As a female artist with a mixed cultural background, I feel that it is important and critical to present these perspectives in our globalized world – where identities: local, national and multinational are more connected, more pronounced and more defined by political and cultural questions and tensions. Through the lens of Chinese Whispers and Other Stories we reflect on the subtle and shifting identities of the 21st century, the dichotomy of East and West, and how we may understand who we are and the places we inhabit. For many there are childhood games that creep up the lower back and lodge in the heart with a deep plunging feeling that accompanies the acute awareness of difference. Playground favourites such as Hide and Seek’s ‘Eenie, Meenie, Miney, Moe’, ‘Chinese, Japanese, Dirty Knees, Look at These’, ‘Tie Me Kangaroo Down, Sport’ and the gesture of stretching the skin at the ends of both eyes to mimic a squinting look that accompanies games such as ‘Ching Chong Chinaman’ are all embedded with racial taunts. Delivered by children they are largely intended without spite but for many these games are an early social reminder of difference. Pia Johnson’s first curatorial endeavour, Chinese Whispers and Other Stories, muses on the experience of finding comfort in difference in multicultural Australia. Delving beyond the whispers Johnson invites the viewer to consider the experience of contemporary Australia informed by a multiplicity of heritages. The exhibition is deeply personal with the four artists — Johnson, Tammy Law, Janelle Low and Siying Zhou — using familial objects, people and locations in which to allow passage for the viewer into their experiences. Navigated through the medium of photography the viewer is presented with the common contemporary Australian experience of being inherently displaced but infinitely connected. Landscape remains as recurring anchor of placemaking; the act of inscribing a place onto a space an intrinsic act in the creation of home. Law’s series of photographs entitled Belonging in Motion (2015/16) examines the experience of migrants from Myanmar in Australia. Here the distinctly Australian suburban landscape becomes the repository of memories where the backyard fence and garage door are intermediaries between the physical and the psychological. The images convey how the experience of Australia here and now can, in an instant, shift into a personal recollection of there and then. The lived experience of migrant Australians remains a constant oscillation of references that interweave. Johnson and Zhou bring the viewer in to the domestic landscape allowing objects and actions in the home to convey experiences of multiplicity. Johnson’s series, Family Resemblance, after Wittgenstein (2015/16), is a collection of disparate images unified by their round form. Enclosed within a sphere the images reference a scientific — almost microscopic — viewpoint presenting to the viewer a series of considered personal reference points. Informed by her Italian-Chinese heritage the composition of the diverse collection of photographs enables them to be read as different but cohesive. The series is an exercise in Johnson’s negotiation of her own heritage of multiplicity. Complementing this examination of the domestic is the video Our first Lamington made in Australia (2015) by Zhou. This playful video depicts a Chinese couple navigating the process of creating the ubiquitous Australian cake. As the couple interchange English and Chinese and use chopsticks to handle the sponge the video becomes a metaphor for multiculturalism; there is a clear excitement of embracing Australian culture which is performed in a distinctly Chinese manner.Low examines ideas of multiplicity and belonging on the most personal of landscapes, the body. The series Reconcile (2016/17) features four images of Low’s own body accompanied by four cryptically paired still lifes. A blue China bowl lies shattered amongst billy balls while torn tofu lies between gum leaves; juxtapositions indicative of her own contrasting heritage. The fragmented thematic continues with Low’s presentation of her own body. The viewer is never able to complete their view of Low, she remains in distinct sections unavailable in her entirety and never perceivable as a whole. Together with the still life images she presents an understanding of self that remains the sum of fractured parts. Low examines ideas of multiplicity and belonging on the most personal of landscapes, the body. The series Reconcile (2016/17) features four images of Low’s own body accompanied by four cryptically paired still lifes. A blue China bowl lies shattered amongst billy balls while torn tofu lies between gum leaves; juxtapositions indicative of her own contrasting heritage. The fragmented thematic continues with Low’s presentation of her own body. The viewer is never able to complete their view of Low, she remains in distinct sections unavailable in her entirety and never perceivable as a whole. Together with the still life images she presents an understanding of self that remains the sum of fractured parts. Each artist in Chinese Whispers and Other Stories delves into their personal experiences to share with the viewer the deeply emotive and complex reality of the multicultural experience in contemporary Australia. Their works are aesthetically arresting and underpinned by a conceptual need to communicate ideas of multiplicity, belonging and the celebration of difference. Mikala Tai is a curator, writer and academic and Director of 4A Centre for Contemporary Asian Art, Sydney. This essay was originally commissioned by PhotoAccess, Canberra ACT. Pia Johnson is a photographer and visual artist, whose practice seeks to investigate issues about cultural difference, diaspora and identity. These concerns have stemmed from her mixed cultural background of Chinese and Italian-Australian descent. Johnson has exhibited throughout Australia, the USA, Japan and Mexico. Her work is collected in private and public collections including the National Gallery of Victoria. Johnson is currently a PhD candidate and sessional lecturer at RMIT University. Selected recent exhibition highlights include solo shows at Edmund Pearce (2014), Stockroom Gallery (2016 & 2013), Studio Kura Japan (2013), and group exhibitions Love, Loss and Intimacy at NGV International (2010), 37° South to 19° North: Australian Photography, Mexico (2015), Maggie Diaz Photography Prize for Women (2015). Tammy Law’s recent work explores stories that stem from lived experiences. Reflective and evocative, her work expresses a fragile kind of belonging in how she addresses themes of migration and home. Law’s images have been showcased in national and international publications such as The Saturday Paper, Asian Geographic and The Big Issue. Law is the Asia Pacific Ambassador for FotoVisura and produced the FotoVisura Spotlight Grant exhibition at the Brisbane Powerhouse in 2015. She was a finalist in the 2016 Lethbridge 10 000 Art Award, 2016 Head On Landscape Prize and a semi finalist in the 2016 Head On Portrait Prize. Since 2007, her work has been exhibited throughout Australia and Europe. Law is currently in her final year of a PhD in the School of Media and Communication at RMIT and is based in Brisbane. Janelle Low was the first in her family to be born outside of Asia. Utilising photography as her primary medium, Low’s practice explores the internal and external conflicts that arise from growing up in multicultural Australia and navigating its evolving cultural landscape. Her work looks into the sense of displacement and ‘otherness’ felt between both her heritage and cultural upbringing, questioning notions of identity and acceptance. Low was the youngest ever, and second female, to win the National Photographic Portrait Prize (2013), and one of the inaugural recipients of the Graduate in Residence presented by RMIT’s Diploma of Photoimaging. In 2015 Low was a finalist in the Head On Portrait Prize and the only Australian finalist in the LensCulture Portrait Prize. Represented by Dianne Tanzer Gallery + Projects, Low has exhibited nationally and internationally with her work held in various private collections. Siying Zhou is an interdisciplinary artist. Her work is predominantly presented in the format of installation. Using various physical arrangements of objects and images, Zhou contextualises the subjectivity of her works and creates a unique aesthetic. Zhou’s artwork reflects her thoughts and contemplation on interconnected subjects, such as the religious practice and cultural traditions in the life of the nomad, identity of individuals within the culture of globalization, the intricate relationship between the land and its dwellers and the correlation of physical and imaginary spaces. Recently, she has been undertaking research in the unfixed social-cultural identity of migrants. Zhou has participated in residencies in Barcelona and Berlin. She has received the John and Mary Kerley International Travel Scholarship (2016) and the National Gallery of Victoria Women’s Association Award at the graduation of Master of Contemporary Art at Victorian College of the Arts (VCA), The University of Melbourne in 2015. Zhou is currently a candidate of Master of Fine Art at VCA. Images | Janelle Low, China and Billy Balls, 2016, from the series Reconcile, archival inkjet print, 60.0 x 60.0cm, edition of 6 + AP | Tammy Law, Away from Home, 2015/16, C-type print, 41 x 61cm | Siying Zhou, Our First Lamington made in Australia, 2015, still from single channel HD video | Pia Johnson, Family Resemblance, after Wittgenstein (detail), 2015/6, inkjet archival print, ea.60 x 60cm | Courtesy the artists.